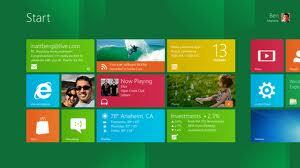 Special preview reveals new interface for the worldâ€™s most popular operating system. The new operating system borrows some features from the increasingly popular Windows Phone operating system, using tiles and apps on an interface that is designed for both conventional PCs as well as tablets.The preview has been well received by commentators, with blogger Zach Epstein summarising it as â€œoverwhelmingly positiveâ€. Microsoft highlighted a number of specific features, and gave each developer who attended the conference a Samsung tablet computer running a preview version of Windows 8. It says a new interface, called â€œMetroâ€ uses a simpler approach that is more appropriate for touchscreens, as well as working with a mouse and keyboard. Similarly, it says the new version of Internet Explorer will allow websites to take up more of the screen and only be conspicuous where necessary. Apps are also set to play a larger role, with whole-screen programmes reminiscent of mobile apps, but able to work together and available from a Windows App Store. On the Microsoft Blog, the company said â€œFor example, you can easily select and email photos from different places, such as Facebook, Flickr or on your hard driveâ€. Microsoft also said that all devices running the new operating system would synchronise more effectively, allowing users to run their apps across, for instance, tablets, phones and PCs. On conventional computers, Windows 8 is built on Windows 7â€™s â€œsolid foundationsâ€ the company said, but will use fewer system resources than its predecessor.